Sometimes I feel a bit out of the loop when it comes to European rock, with so many bands out there that to try and keep up would mean I’d have to live with a pair of headphones stuck to my head 24/7. Peter Tagtgren, the mastermind behind Pain, is a man I only became aware of when I saw him support Nightwish, and to be honest I wasn’t that impressed with his industrial techno metal. With this in mind I wasn’t expecting much from this, his sixth studio album. 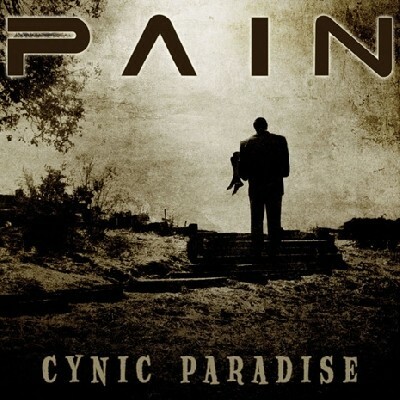 Mostly, ‘Cynic Paradise’ gives the listener just what they expect, with the music pitched somewhere between Rammstein, Nine Inch Nails and Andrew WK. It’s industrial, yes, but with more melody than much of the genre, supplied by some nice layered keyboards. There’s even some great slide guitar on the blusier ‘Have A Drink On Me’, for me the best track on the album if only because it shows a bit more imagination than the rest. Nightwish fans will be interested to know that Anette Olzon guests on a couple of tracks, but to be honest she’s not exactly allowed to shine. ‘Cynic Paradise’ doesn’t float my metal boat, mainly because it’s pretty repetitive and I had trouble listening to it all the way through in one go, despite repeated attempts. It’s not so bad that I can make a nifty pun on it being ‘Pain’-ful to listen to (har de har), but I won’t be coming back to it in a hurry.